mistersquid: a digital fiction: Wanna Grab Lunch? Joel Spolsky»no relation« recently wrote up some of his thoughts about lunching with coworkers. I’m right with Spolsky on this one. Lately, my work queue has been so long I’ve resorted to eating in front of my computer while continuing to meditate on the problem du jour. Doing so’s affected my work friendships, attenuating them to the point I’m spending nearly no time with them outside of work. To be honest, I don’t think there’s much to be done about it for now. It’s a work rhythm thing, and I count myself among the lucky that I enjoy my work enough not to resent the immersion. Thinking to a couple months back about how office work lunch cliques worked out, I noted there was a clear demarcation about who ate with whom. I’m a tech and when I started I ate with the other Techs. The PMs»Product Managers« are few in number and they tended to eat in pairs or singly, but that changed when two PMs and I began regularly lunching together. We’d go get tacos from the truck or sit in the sushi boat. Good times. Over the course of months, the group grew to include people from IT»Information Technology«, Tech, and Marketing. Though people from sales and client services didn’t eat lunch with us»They do often lunch with each other.«, we all occasionally did (and do) meet up after work. I can’t speak to the cohesiveness of the company as a result of eating or not eating together, but I do have a vague sense of the way social bonds are reflected in people’s lunch habits. In other words, for lack of data my “study” is inconclusive. 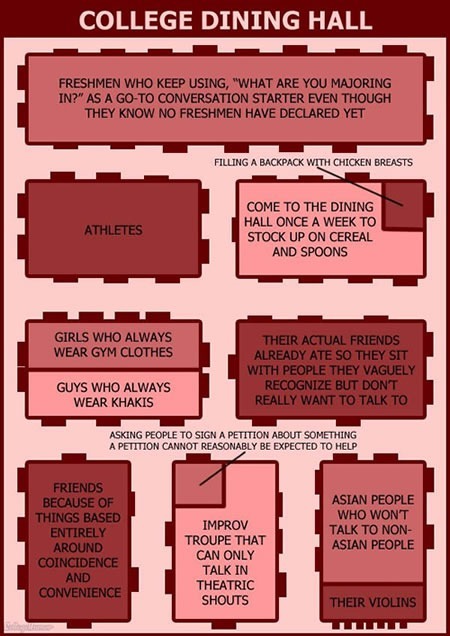 Maybe it’s really just an example of what happens in college cafeterias. Interesting stuff. I LOLed at the org chart. Thanks, Johnnie!